The New Year is nearly upon us! Is your home ready for the coming year? You need to ensure your home is on trend all 365 days of 2019. 2019 is all about self-improvement, the house that is. Make this year the one you improve the things about the house that have been bugging you. Natural wood is the top trend of the new year! Your new floors and home accents deserve that natural look that wood offers. 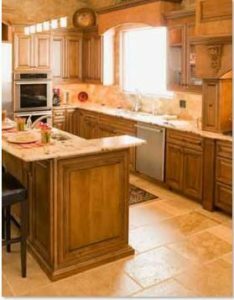 Consider using a dark stained wood to warm up your kitchen. If hardwood is too expensive, consider using vinyl flooring, which is cheaper, resilient, and easy to clean, perfect for the kitchen. You have the natural wood, now incorporate nature indoors! Incorporating sage colors with live plants is another predicted popular trend this coming year! Liven up your home with shades of green and brown, include lots of live plants and light to really elevate your homes glow. Visit our Pinterest page to for more ideas and DIY projects to bring your rooms to life! Find all your new year options on our website to accommodate your 2019 home! Let us help you find the perfect fit to your flooring needs, whether it be carpet, hardwood, laminate, tile, or vinyl. We will find what floor you need at a great price, and even install it for you! Let Carpetland U.S.A help you bring in 2019 to keep your home in trend all year long. Carpetland USA has several wood options for floor or home accents that will place your home above the rest! Come see us for your carpeting and flooring needs, and don’t forget to check out our Pinterest page for more home inspiration!